After one last continental breakfast at our hotel in Agadir, we departed this morning for Sidi Ifni. On the way, we would be stopping in Tiznit, where a silver market was located, so many of us exchanged money for some Moroccan dirhams. It always amazes me how colorful other countries' money is; ours is somewhat boring in comparison! Our exchange rate was favorable--approximately $1 USD = 8 dirham. I really enjoyed Agadir and thought it to be a great introduction to the country. As a somewhat tourist destination, it eased us into the culture and helped us become familiar with our surroundings and the language, to a point. 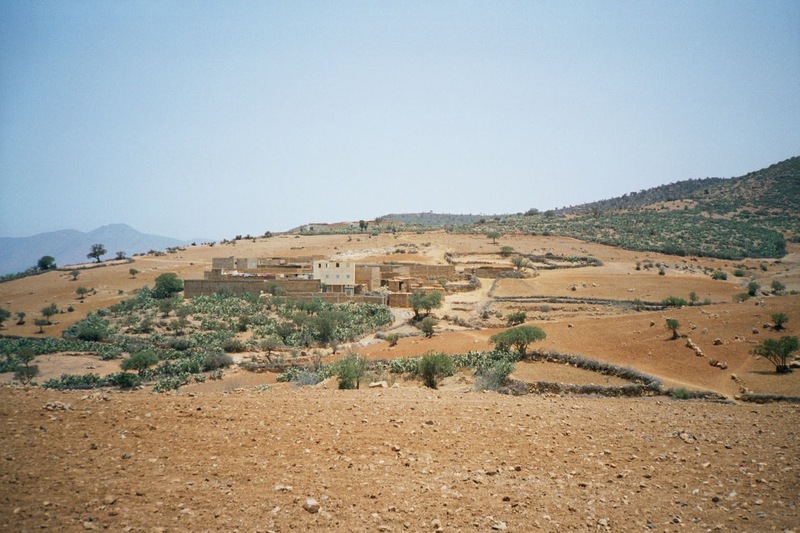 However, our next destination, Sidi Ifni, is a small rural town on the southern coast, and I expected the environment to be very different and to feel more immersed in the Moroccan culture. The drive to Sidi Ifni was filled with amazing views of the countryside, and eventually, the coast. Although the drive was long, I didn't want to fall asleep because the landscape constantly changed. We departed the Agadir coast, then transitioned to rural farmland, mountains, cliffs, and many, many sheep! Eventually we reached Tiznit, a small city with a shopping market and restaurants. Here, I instantly felt like a tourist and much more out of my comfort zone. When traveling, I always feel compelled to try to blend in and live as one within the culture; however, Moroccan and Islamic culture (especially the Arabic dialect) posed greater challenges to this approach due to my unfamiliarity and physical distinction. Additionally, we are a group of 14 diverse, chatty, and mainly-female Americans, so the stares from the natives were somewhat justified. At the silver market, our speaking partners helped us bargain with the vendors and ensure we weren't ripped off. While it was fun watching Dr. Newcomb and Leila banter with the vendors, I also felt a little frustrated not being able to communicate. Gestures and facial expressions can only go so far for a dialect so different from English. Language barriers are tough, but they both got me a good deal on a silver hand of Fatima necklace and some earrings! Shopping in the market with Lauren, Sofia, Julia, and Jamila. We then had a traditional meal of tagines, large clay pots in which a variety of vegetables, meat (lamb/chicken), and cous cous are cooked. The tagine gives the meal even more flavor, and traditionally, they are consumed communally, with each person eating just the section in front of them. The meal was very colorful and rich--and was, of course, accompanied by lots of bread! This quickly became one of my favorite Moroccan meals. After a few more hours of driving, we finally descended on the coast once more and the small town of Sidi Ifni seemed to appear out of nowhere. Sidi Ifni is a popular surfing town, but for the most part, is very quiet and quaint. After just a few hours here, I instantly felt comfortable walking around, and a group of us ventured to see the beautiful coastline views. Afterwards, we headed to Jamila Bargach's foundation, Dar Si Hmad, for dinner and conversation. We had some soup, kabobs, and zucchini with a tomato sauce that absolutely exploded with flavor. Over dinner, Asma (one of the speaking partners) and I discussed similarities in Moroccan and US education systems, favorite traditions, and her favorite cuisine--eggplant salads! The speaking partners give us fantastic first-hand views and opinions and have really helped us integrate into the culture. This aspect of our program has helped me learn so much more, while also making friends across the world. After dinner, our group took a walking tour of the city, which seemed to absolutely come to life at night! During the day, men could be found sitting at some of the few cafes, and not many women were in sight. However, at night, many young people were hanging out by the beach, and women and their young children all socialized at the central park. Men still occupied the cafes and restaurants, which was an interesting observation on gendered space. While women typically occupy the home, and men, the public sphere in Moroccan culture, here, all the women brought their children to play while they socialized with one another. Dressed in traditional jellabas, they were all smiling, laughing and enjoying each other's company-surprisingly still at 10 pm! Luckily, it wasn't a school night for the kids. Since Sidi Ifni was colonized by the Spanish, many Spanish-style architecture exists, but these buildings are vacant due to some enduring tensions between the Moroccan and Spanish governments. Most were poorly maintained, but the contrast between the architecture styles was a testament to the history of this city. Many of the elders, we were told, still spoke some Spanish, but aside from them, everyone mainly speaks French and the Moroccan dialect of Arabic. Maria's ("the last of the Spanish") home, an enduring symbol of nostalgia. Although today consisted of a lot of traveling, it nonetheless still provided us many experiences with globalization. Not only the contrast between popular, touristy Agadir and the traditional, rural town of Sidi Ifni, but also the changes in cuisine, dress, appearance, and dialects spoken by the natives exemplified how diverse Morocco is, and how in a developing nation, development isn't always planned--its often unevenly spread throughout the country. This summer, Dar Si Hmad is planning a water-education program for rural children in the poor region of Ait Baamrane, Southwest Morocco, in collaboration with the delegation of the Ministry of Education in Sidi Ifni. 50 children ages 7-13, on vacation, with no opportunities to continue learning, will participate in this thematic based-curriculum. These children live in remote, landlocked rural areas with very limited access to and knowledge of the outside world. This program will raise youth curiosity surrounding cycles of water, educate them on sustainability, conservation and ecological issues. 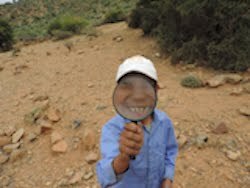 Through scientific lenses, the children will build awareness and discover connections between themselves, their environment and the world beyond. Despite noteworthy State efforts, rural children in Southwest Morocco continue to suffer from poor education, ranging from inadequate facilities, lack of water and toilets, language of instruction being Arabic in a predominantly Berber world, to teachers’ absenteeism. Children of all ages and levels study in one room with one teacher, being passive listeners instead of active participants in their own learning. Curriculum is barely covered and rarely understood by the students. By providing the children with a pedagogy that is fun, interactive, participatory and encourages experiential learning, we stimulate intellectual growth, and help all children, especially the girls, join high-school. Children will be encouraged to influence how the environment is shaped, to become initiators of steps to secure the future in their homeland. They will discover and grasp wider dimensions of water, sustainability, and the equation of water-health. The school will nurture their curiosity, equip them with basics to succeed and continue their studies. Dar Si Hmad plans on making the water-school a yearly-program, plus partnering with other associations to implement the curriculum in adjacent regions. 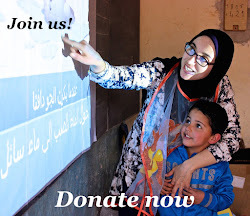 To support this program, please make a change by donating to our project on GlobalGiving. Thank you and keep checking back for updates on this project!